marinelandpets has no other items for sale. I have been using Frontline on my cats for years, but it is a struggle to catch them and apply this once per month. This is what brought me to try these collars that you only have to replace once every 6-7 months to make my life a lot easier. 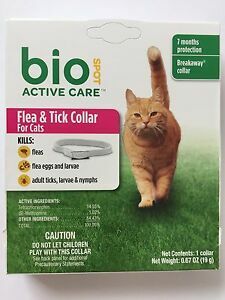 So far, since I purchased these last month, they do work to kill the fleas (we do not have any ticks on the cats, but if they did I would say the it would also kill them as well). Price is good for cat collar! Have not used yet; kitten is too small but will in a few weeks! Collars good on fleas, but one out of the three diidn't stay attached on. Good collars, but not strong enough to keep on all my cats, we lost 1 out of 3. Best Bang for the Buck $. Works as good as the over priced Bayer collars, buy 3 get 21 months protection.